Reflecting the sea change in lifestyles for the over-65 set, the share of their total income that America’s elderly earn from working has almost doubled over the past two decades. That’s a central conclusion of research by the Brooking Institution’s Barry Bosworth and Kathleen Burke, who compared the 1990 and 2010 sources of income for the nation’s age 65-plus population in a paper funded by the Retirement Research Consortium, which supports this blog. Some things haven’t changed. The share of the elderly’s income that comes from Social Security, employer pensions and – for the poor – government aid such as welfare has hardly budged over the past two decades. But the earnings the elderly derive from employment soared from 18 percent of their total income in 1990 to 31 percent currently. The primary reason is that more Americans are working longer and delaying retirement, a multifaceted response to better health, more education and – at least for some – growing financial insecurity. Consider the 89-year-old worker for the Massachusetts Department of Transportation who is that state’s oldest employee – and loves it. “Epstein enjoys his job so much that his co-workers sometimes catch him humming,” a Boston Globe article said. At a manufacturing company in suburban Boston, the median age of workers at Vita Needle is 74; some of these workers will discuss employment at their age in a video in next Tuesday’s blog post. These may be extreme cases, but the average U.S. retirement age is ticking up. The sharp decline in income from investments – from one-quarter to just over one-tenth of the elderly’s total income – is more difficult to explain. One clear reason is the plunge in interest income on their investments. In the early 1990s, for example, yields on bank certificates of deposit popular with the elderly were in the teens – they’re bumping around 1 percent today. Another reason is U.S. employers’ transition from a defined-benefit to a defined-contribution pension system. 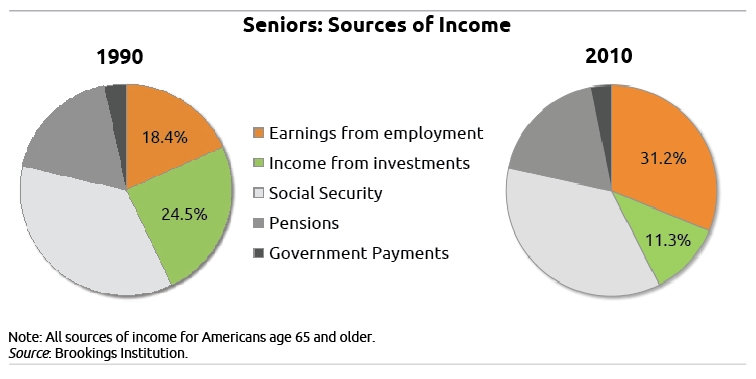 When today’s elderly draw on the financial assets they’ve saved over their lifetimes in 401(k)s and IRAs, these sporadic lump-sum withdrawals don’t register as income in surveys that record only regular payments, such as the U.S. Census on which the above chart is based. To read an executive summary of these findings, click here. To exclude from consideration the major sources of retirement income provided by such DC plans as IRAs and 401(k)s (which increasingly dominate U.S. retirement saving) prevents getting a true picture. Because relatively few people annuitize, DC plans normally provide “sporadic lump-sum withdrawals.” Those withdrawals pay for food and clothing and shelter, for transportation and healthcare and entertainment, just as would regular payments. I believe that the elderly have the right to choose when they want to retire. It’s good to hear that their earning more for themselves than just staying at home doing nothing and earning nothing. And if they are happy working then we should support them, right? And also, elderly people have a great tendency to experience depression, so why stop them from doing what they love? I salute those elderly people who delay their retirement. Keep healthy! Kudos to those choosing to work past their scheduled retirement age. For many of us, work is our identity and keeps us around longer. Great Job. To think that we now live in a world where income defines retirement rather than age. Everyone tries their best to contribute to the working world and the smallest margin of people get the higher paying jobs. So the rest do not have much of a choice but to earn their income through the lower paying jobs. There are people retiring at the age of 22 these days! I really do worry about Social Security being available in 30 years when I am ready to retire. I am not counting on it.